Toll Brothers' (TOL) share price declined 33% in 2018, despite beating analyst estimates consistently throughout the year. The primary reason behind this downturn is the pessimistic outlook of the housing market in the United States. On the back of 4 Fed rate hikes in 2018, Toll Brothers has taken a hit in its order flow as mortgage rates continued to rise. And because housing depends heavily on macroeconomic factors, we can't look at the company in isolation from a bottom up perspective only. There are negatives and positives underpinning the housing industry, but the big picture looks much more negative than positive. On this one, however, we are putting on our contrarian hat and betting that the worst is behind us even if growth isn't going to be as robust as we originally thought. Founded in 1967 by Bob and Bruce Toll, Toll Brothers is the nation's largest builder of luxury homes. 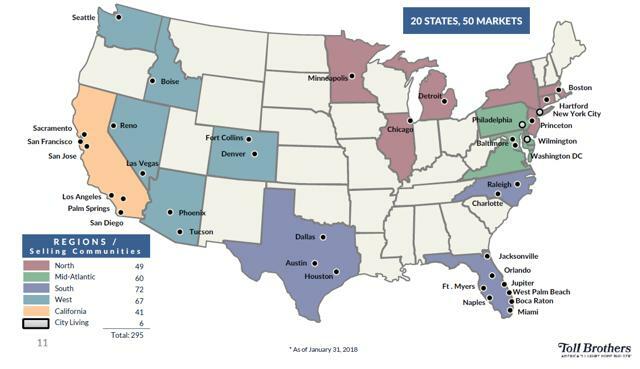 It has operations in over 20 states and 50 regional markets and typically caters to the active adult, empty nester, and second home buyer market. While it specializes in the construction of luxury single-family detached and attached homes, it also develops master-planned resort style urban low-, mid-, and high-rise homes. The company also has a few subsidiaries under its umbrella, covering its architectural operations, golf course development and management, mortgage operations, and land development and sales. Toll Brothers has historically focused on acquiring land in prime locations for development purposes, which has allowed the company to charge higher average selling prices. In addition to its traditional offering, more recently, Toll Brothers has focused on developing for-rent projects as well – a good hedge against a slowdown in homebuying. As luxury home-building is Toll Brothers’ main business operation, the company naturally has to target a much smaller yet more affluent audience, in comparison to other traditional homebuilders. Unlike lower cost, standardized homes, luxury home building is centered on customization, and Toll Brothers’ brand value is synonymous with superior, customized homes. Homebuilder performance is closely tied to the overall performance of the economy. We have witnessed an 8-year economic expansion, however, and housing has yet to reach levels it peaked at just before the 2008 recession. Part of the reason for this is consumer caution of making major financial decisions after experiencing the worst economic slump since the Great Depression. But as consumers started gaining confidence and household formation began to increase again, instead of increased homebuying, we saw the rental market benefiting the most as many millennials started leaving home and finding rental apartments in urban centers. Now, the economy is well into its recovery and arguably closer to the next contraction than the previous one. Despite very tepid growth over the last 8 years, we finally started seeing a pick up in inflation, and with it, Fed rate hikes, which act as brakes on the pace of economic growth. This is not necessarily positive for the housing market. 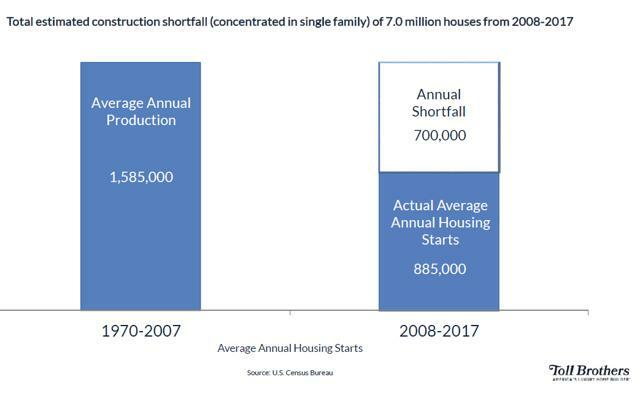 The challenges for the housing industry now are less related to demand factors but rather, the inability of prospective homebuyers to afford to buy a home – and – if talks of an economic slowdown intensify – increased cautiousness for making the commitment to buy a home. Interest rates have risen over the last two years, in line with multiple rate hikes by the Fed, intended to get ahead of inflation and give the Fed some flexibility to lower rates in the event of another slowdown. As most readers know, rising rates present the biggest risk to the home building sector, as consumers would be discouraged to pursue homeownership as the cost of borrowing increases and the attraction of renting over buying is further solidified – at least on a cash flow basis. The 30-year mortgage rate has risen gradually since the latter part of 2016, and so far this year has dropped back down around 4.5%. 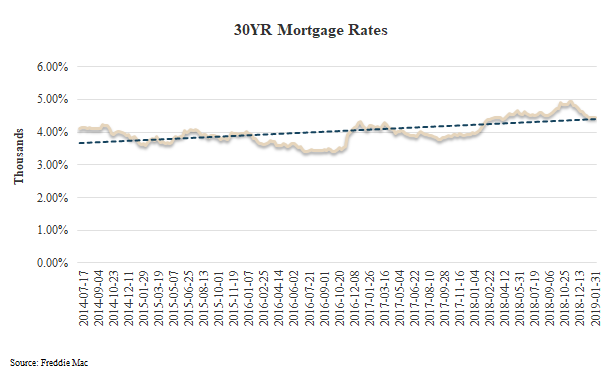 Even though the rate has decreased slightly, the overall trend remains a concern to consumers even if the recent pullback in rates may result in a short-term buying spree. While not the only factor, rising rates have likely contributed to a 13% decline in number of orders for Toll Brothers in Q4. A report by Wells Fargo: "Builder Impairments from Potential Home Price Declines Overstated" outlines that the real estate market, especially in the West, is likely to suffer further impairment even as it claims the overall impairments to builders nationally are overstated. 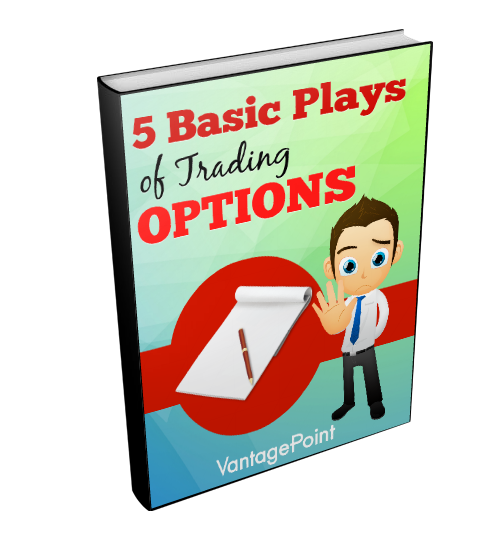 The report outlines that this market segment – West and California – has previously been the most volatile. The heavy weighting of Toll Brothers' portfolio within these regions could be cause for concern. 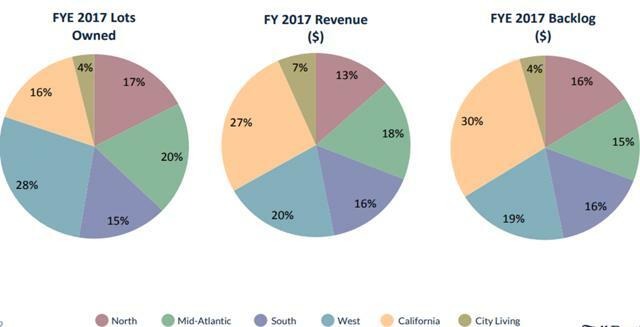 As reported in the company's conference call, 44% of the firm's portfolio is focused in the regions mentioned above – see the chart below. The areas are not only the largest by number of lots owned but also by revenue generation and backlog. As a result, the firm is specifically prone to drivers that may only impact certain regions rather than the real estate market nationally. This could be both good and bad, as the real estate market in its focus regions could perform well even as national markets deteriorate. But the opposite is also true, where specific drivers not relevant to the national market could have an adverse impact on the company's results. While the report concludes that the current impairments have been overstated, events specific to the region could result in increased volatility in the company's stock price. We are mindful of this but think the risks we see on the horizon are more broad in nature and that a focus on specific regions makes it easier to manage risk. The trade war situation which resulted in America imposing sanctions on imports of several inputs needed to construct homes, has led to higher prices for home building inputs. A further rise in these input costs will bring about an increased level of uncertainty in housing markets, and house prices will continue to rise, further eroding demand for new houses. 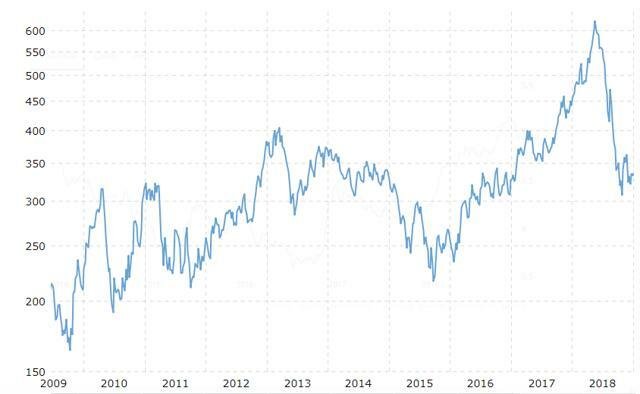 Lumber prices reached an all-time high in May 2018, but have declined since then. However, lumber prices still remain significantly higher than reported figures in 2015 and 2016. While this has been a long-term risk and a short-term opportunity, we have also invested in PotlatchDeltic (PCH) which is leveraged to rising lumber prices and hence, a good stabilizer to any risks imposed by higher prices on Toll Brothers' operating results. 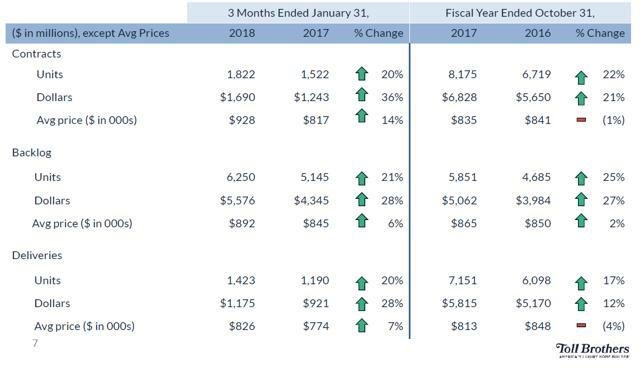 Steel prices have also risen sharply over the last two years, which has become another point of concern for homebuilders. Lastly, the cost of labor has also jumped up sharply, supported by historically low unemployment levels. The average hourly earnings reached $27.60 in January, but the rate of growth remains subdued. Despite the increase in costs, however, gross profit for TOL in the quarter ending October 2018 was 21.4%, higher than the previous quarter and down only 93 bps from the same period in 2017. Pre-tax income also remained robust at 16.15% compared to 14.9% in the same period last year. We used pre-tax income to eliminate the impact of any tax reform benefits but even net margins increased over the period. 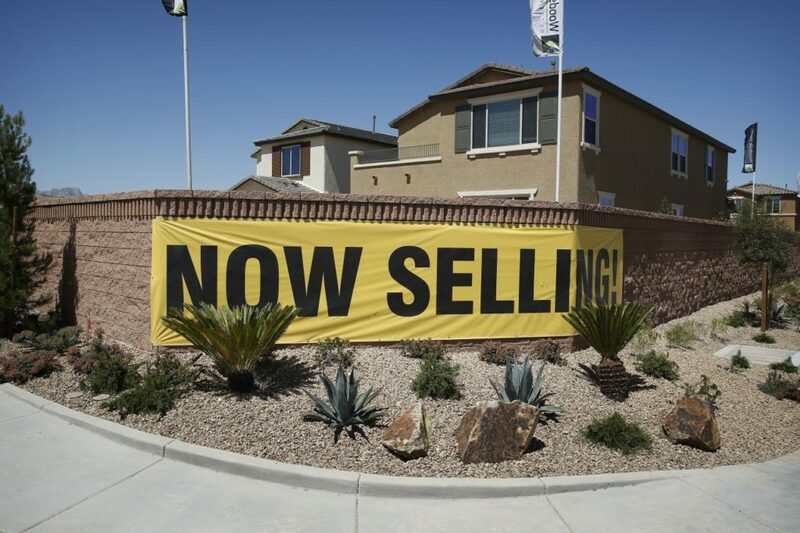 The recent slump in sales of new and existing homes across America can be considered another warning sign of a cooling housing market, which will likely will result in slower sales for homebuilders. Aside from the last reading, which surprised to the upside, new home sales have been lackluster, to say the least. Despite the 8-9 year economic expansion, new home sales are nowhere near levels reached before the financial crisis. 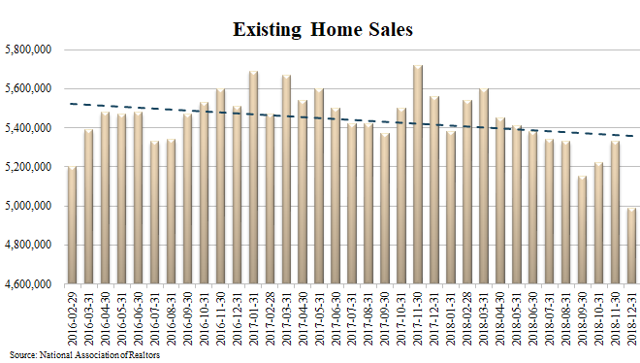 Existing home sales aren't faring much better. All the reasons and data listed above are pointing toward a cooling housing market. There are some positive trends in the economy, however, that could compensate for declining affordability. Historically low unemployment level and rising wages - While rising average wages are a concern from homebuilders’ perspective, higher income levels are a positive driver for demand for houses. Increasing wealth - Overall income level on a global basis reached new highs in 2018, and personal disposable income in the U.S. is at a historic high. While a higher personal disposable income does not directly translate into activities in the housing market, this certainly boosts consumer confidence in purchasing a new house or upgrading to a new home. Rise in building permits and housing starts - An increasing number of building permits and housing starts is a leading indicator of potential future sales – at least of new home sales. We have seen building permits remain steady during 2018 ranging from 1.2 to 1.4 million, but it hasn't necessarily translated into housing starts. This potentially indicates delays in building from the time permits are issued to ground-breaking, which could be a negative signal. However, it also means homebuilders can easily ramp up housing starts if demand spikes. 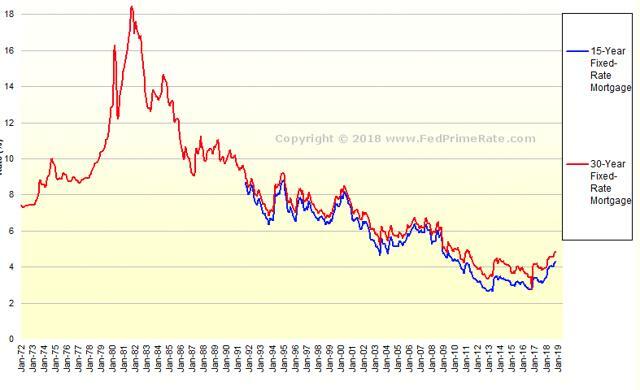 Even though rates have risen gradually over the last couple of years, 30-year and 15-year fixed mortgage rates are nowhere near historical highs, and well below 6%+ figures reported in the financial crisis era. If consumers can get past the fact that a sub-5% mortgage rate is still VERY attractive, we could see a renewed interest in home buying. Unfortunately, rates have been low for so long it could be a while before consumers get used to the new 'new normal' rates. Vacancy rate has continued to decline since 2010, which is indicative of the increasing demand for properties that are for-rent. Homebuilders who have diversified into the for-rent segment as well as Single Family REITs will continue to benefit from this trend, and as we mentioned, Toll Brothers has established a for-rent component of its business. For Toll, the year-end backlog has grown, both from a dollar perspective and units perspective, which represents a healthy future outlook even if the current environment pushes out the realization of those new units. Toll Brothers also has a solid balance sheet, with $1.18 billion in cash, which can be used to acquire properties or returned to investors. This is important for the management and positioning of a possible downturn. Despite the tepid outlook on housing, it only serves to provide a rationale for why we are less optimistic about the company than we were previously. Part of the reason is the stock's 12% return over the last month. We first rated it a Buy on January 3rd, at around $33. We still like it and still believe it is a good Buy at $37. The company's position as the largest builder of luxury homes and above-peer operating margins argues for a premium relative to peers, even though the other side of the housing debate is that builders focused on serving the entry-level market are more attractive. We too believe that the low end of the market has upside potential, but we have more conviction that TOL will gain market share at the high end of the market and outperform both the S&P 500 and peers. At the moment, homebuilder peers are trading at a multiple of just over 1 while TOL has historically traded at 0.8x to 2.1x book value. According to Argus Research, if we apply a 1.2x price/book to the consensus book value forecast of $37, we arrive at a price of $44. Argus comes to a similar price target if we use a PE ratio of 9x, which is well below recent levels, to arrive at a price of $43. This is down from Argus' previous price target of $55 but is still a 16% price return from today's levels. This is definitely one of those opportunities that can be lost in the chaos of the media's focus on macroeconomic challenges. The fact is, Toll is well positioned to grow even if at a slower pace than previously expected AND the company's focus on higher income households makes it less sensitive to the decline in affordability that could impact the lower end of the market.